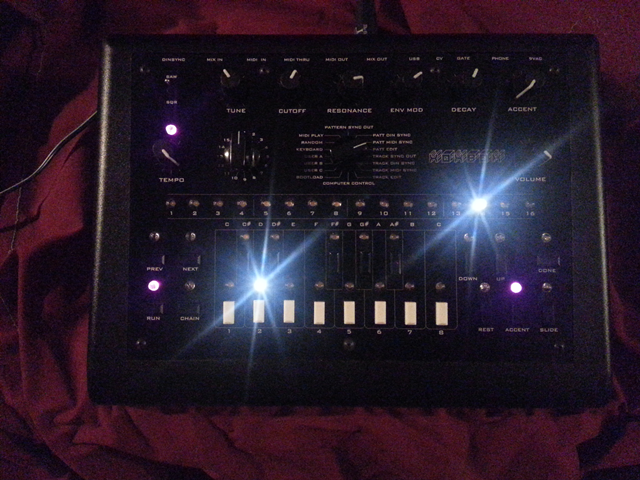 Welcome the latest addition to my studio: a x0xb0x, built from the willzyx black panel kit. I substituted specially sourced hard-to-find Nichia warm white and pink LEDs for this project. Comment if you want me to dig up the specific part numbers. This photo doesn’t do them justice. This entry was posted in Development, Hardware, Music by Wohali. Bookmark the permalink.